Refreshing a Whitehall Washington Park Zulu, with a Little Help From an Erstwhile Apprentice. 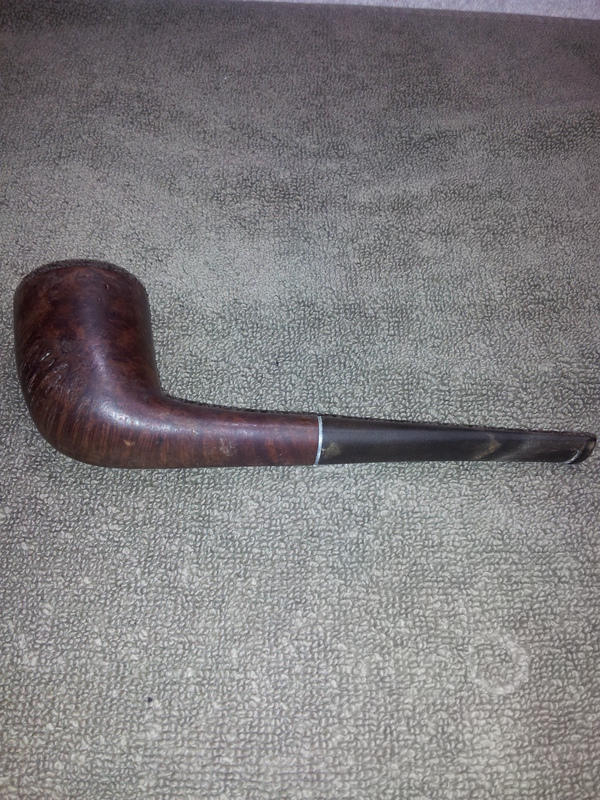 This restoration is a bit special for me, not for the pipe, but rather for the refurbishing apprentice I gained on this project – my daughter. Interested to know more about a subject that obviously captures my attention, my daughter asked if she could help with a refurb. Naturally, I gave her free pick of the pipes remaining in my box. She selected this Whitehall Washington Park Zulu. 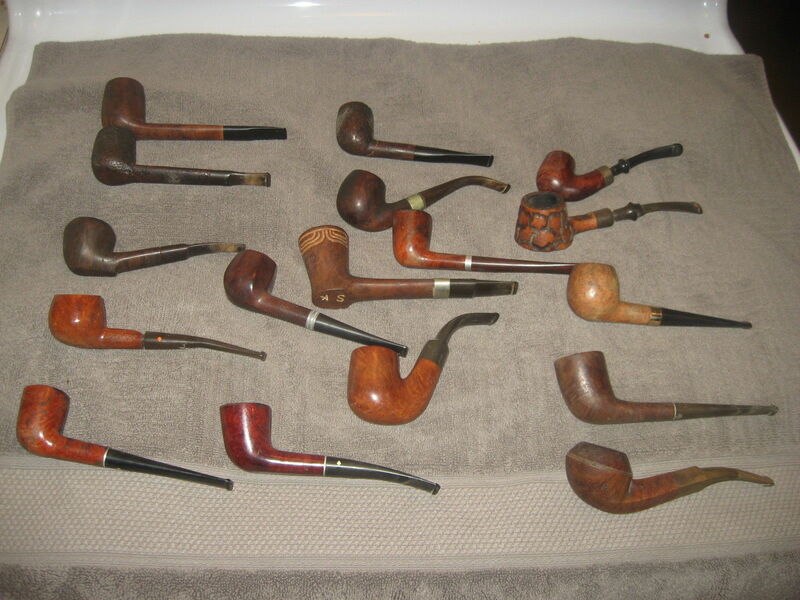 It is the pipe second from the bottom on the far right of the picture of my recent estate lot purchase. It was in fair condition when received – dirty and grimy to the touch like all the other pipes in the lot, with tars on the rim, lost fills on the bowl, and uneven ridges on the front edge where the harder grain seems to have risen, giving the front a washboard texture and appearance. The stem suffered from oxidation and calcium/salts buildup, as well as several tooth dents on top and bottom of the bit. One larger tooth dent crossed the top right edge of the button, leaving it looking uneven and slightly dishevelled. On the up-side, the threaded aluminium tenon wasn’t over-turned like so many estate pipes, though the original stinger had been cut off, leaving only the tenon threads in place. 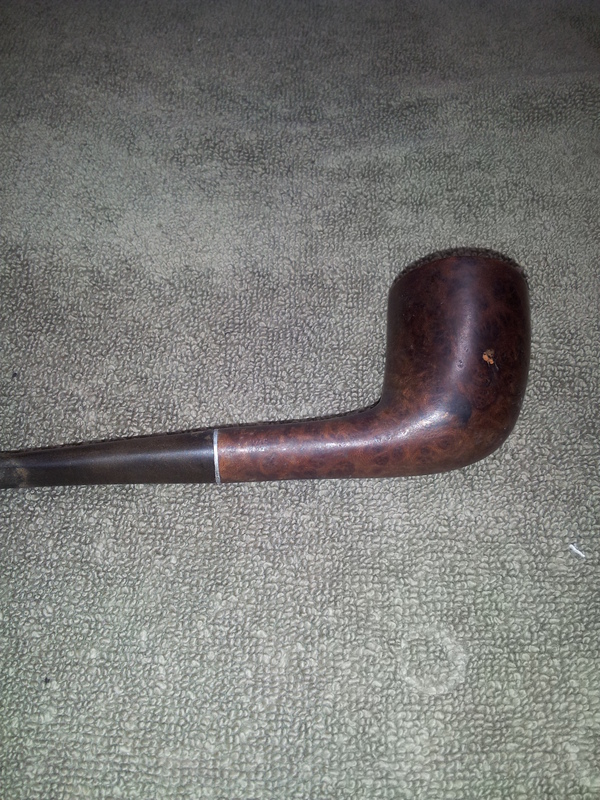 We started this refurb by dropping the stem into a warm Oxyclean bath while we worked on the stummel. The bowl received a quick reaming to remove the relatively small amount of loose cake. I used a pen knife on the cake, followed by a few twists of 80-grit sandpaper wrapped around a dowel. This quickly removed the cake almost to bare briar – thin enough to get a good look at the interior bowl surfaces. This bowl is in good shape, without interior cracks, burns or fissures. 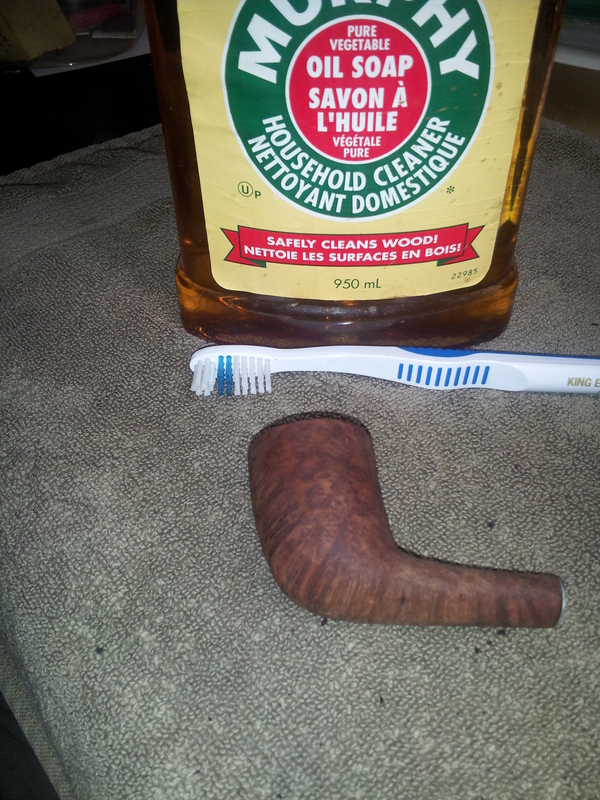 In order to give the rest of the stummel a good initial inspection, the bowl and shank were then scrubbed down with Murphy’s Oil Soap and an old toothbrush, and a Magic Eraser made short work of the tars on the rim. The Murphy’s removed the grime and sticker residue from the outside of the bowl and allowed a better look at the briar underneath. Several spots were identified that would need a bit of help to replace old fills, but the major issue with the stummel was the “washboarding” of the grain at the front of the bowl. Thankfully, this bowl has nice think sidewalls, so we could safely sand out the ridges and return this bowl to a smooth, glossy surface. I apologize for the lack of pictures of the rest of the cleaning and sanding process; I was focused more on teaching and supervising my apprentice pipe refurbisher during this job than I was on working the camera. 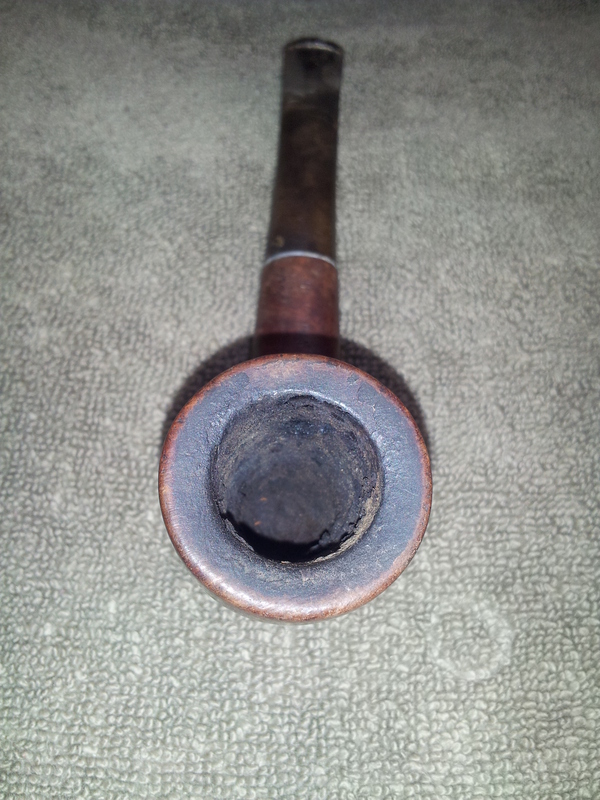 The stummel went into an alcohol bath overnight to remove any old finish and soften the tars and buildup in the shank. My daughter was both fascinated and a little grossed out by the sheer number of pipe cleaners it took the next day to get the shank clean, but we got through it. 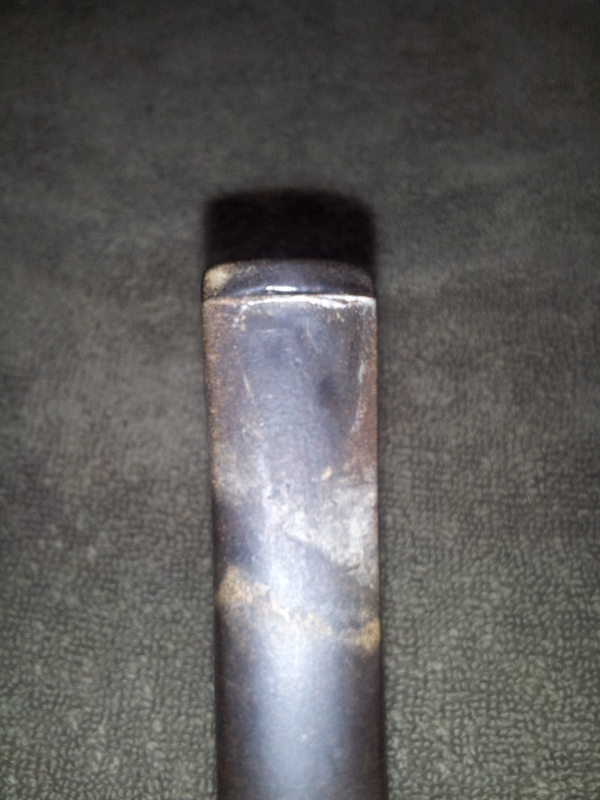 Here’s a pic of the stummel after initial cleaning. 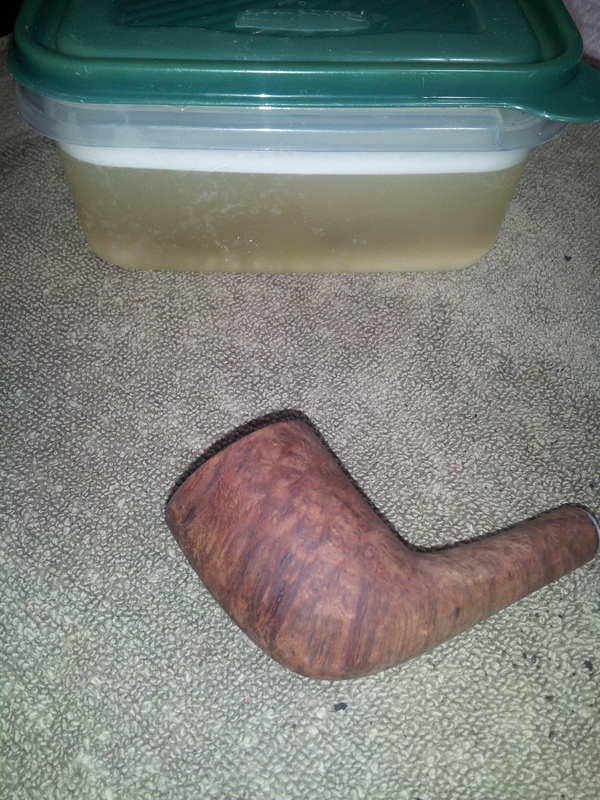 The stem is in its Oxyclean bath in the container behind. 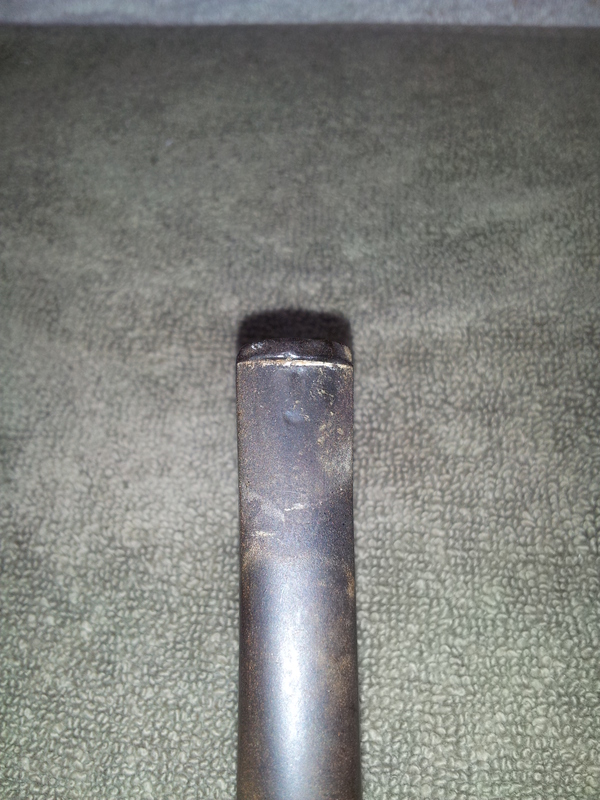 The stem came out of the Oxyclean and was scrubbed down with 0000 steel wool and a Magic Eraser to remove the oxidation. 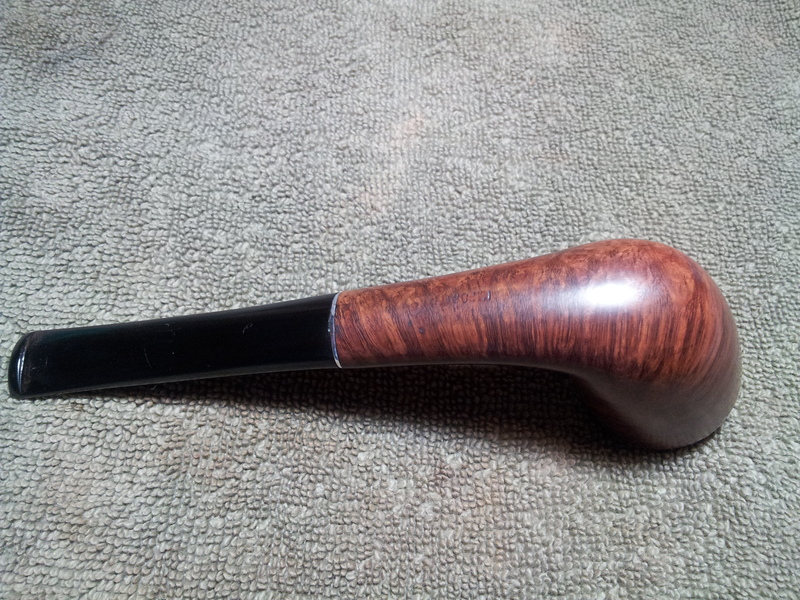 We then wet-sanded with 600-2000 grit wet/dry paper to smooth and polish the stem. This removed all but the deepest tooth dents, which were filled with a mixture of CA glue and activated charcoal before being shaped and sanded to 2000 grit. 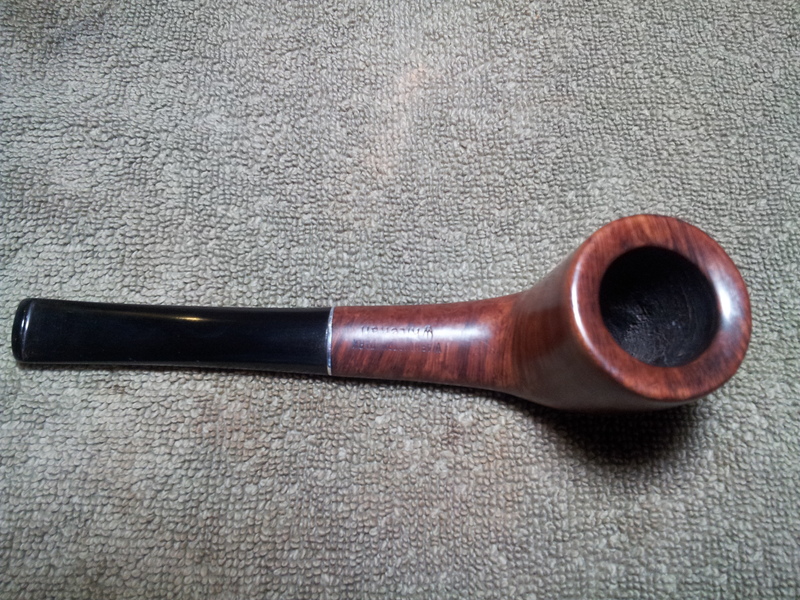 The larger pits in the bowl were filled with briar dust and CA glue, and then the entire stummel was sanded with a progression of 220 – 2000 grit sandpapers. We stained the briar with a diluted Fiebing’s Saddle Tan stain, let it dry, then wiped the entire pipe down with mineral oil to enliven the grain and give the pipe a much richer overall appearance. Then it was off to the buffer, where my apprentice watched as I ran the pipe through my 4-wheel buffing process: Red Tripoli, White Diamond, several coats of wax, and a final buff on a clean wheel. 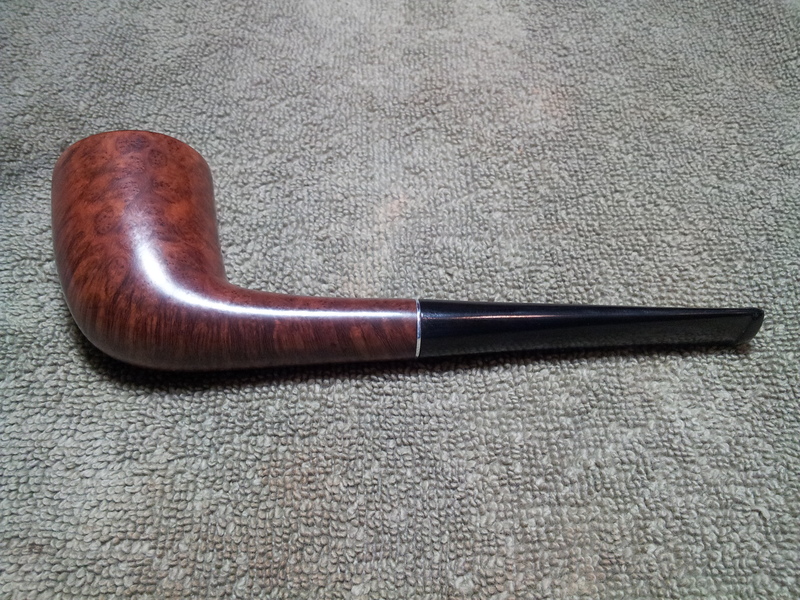 It came out nicely, I think – the bowl is silky smooth in the hand, and the pipe sits comfortably in the mouth, the overall balance of the pipe assisted in this regard by the wide fishtail bit. 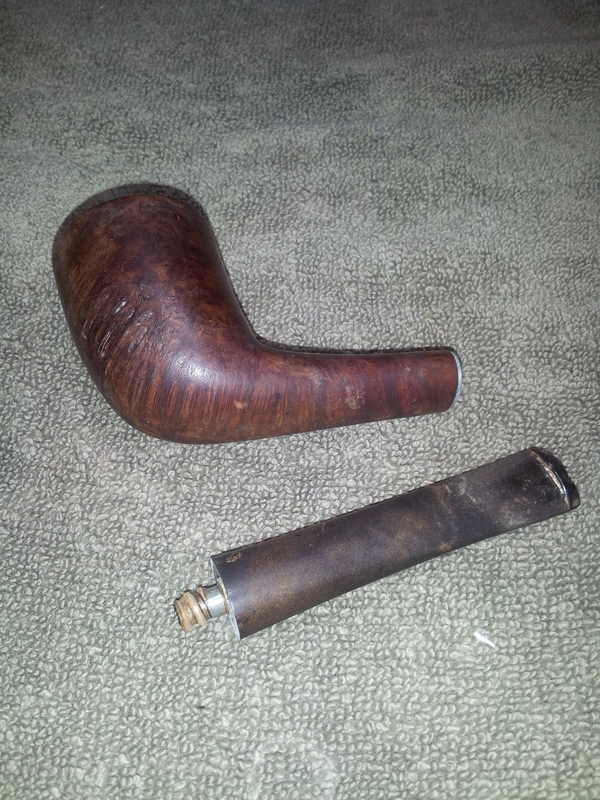 My daughter also now has a much better appreciation of the time and labour that goes into refurbishing an estate pipe, though I’m not sure I’ll be able to convince her to clean out another tar-filled pipe shank any time soon. My apprentice, it seems, has a natural aversion to dirty pipe cleaners, though, somewhat oddly, this aversion to muck doesn’t seem to extend to shovelling out horse stalls at the barn. To each their own, I suppose! 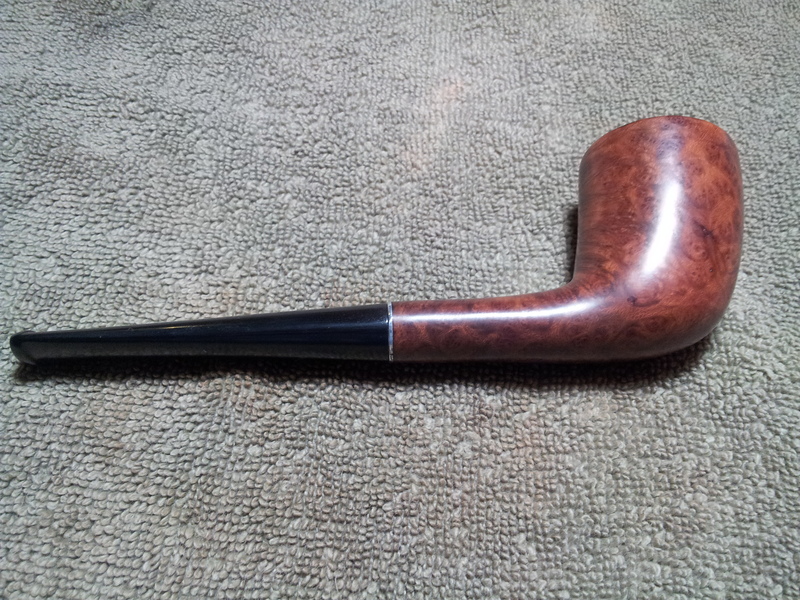 Congratulations to both you and your daughter for a fine job on a beautiful pipe! Thanks Anthony. It’s usually the little things thst make the biggest impressions. This Zulu will be on my rack for years to come & I will remember working on it with my daughter every time I see it. I hope she will also have fond memories of this project with Dad. Great work and even better to have help with it. I was touched by the father daughter work on this one being a dad with four daughters it is always great to have them join in the work. Well done.